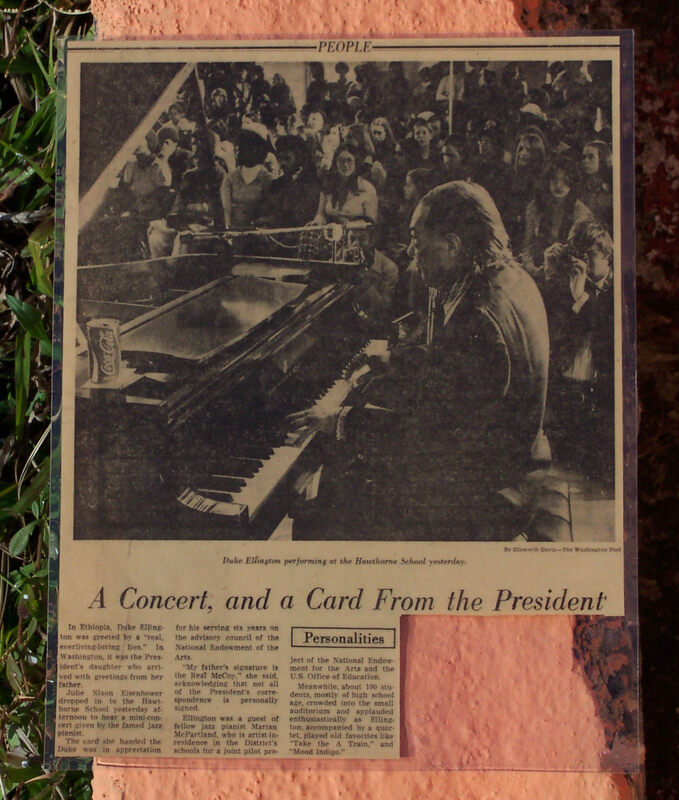 On February 11, 1974, Duke Ellington gave the final concert of his long and distinguished career in the auditorium of the Charles Sumner School building, which was at that time the home of the Hawthorne School. 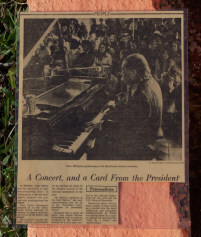 The next day, the Washington Post ran a short article about the concert. Dexter Flood carefully preserved the clipping, and sent us the picture at left (click it for a larger image). Dexter has identified some of the students visible in the Post's photo: at center front row in glasses and plaid pants, Ellen Vogel; Dexter is to her right, and to his right is Bernadine (Bernie) Greene. If you recognize anyone else, please let us know. The Coke can which is sitting on the Duke's piano at the left of the photo still exists. Dexter and Ellen sliced it in half, Ellen kept the upper part, and Dexter has the lower part, seen at right. 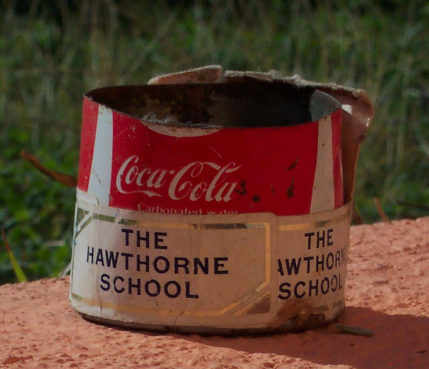 This gives a whole new meaning to the concept of splitting a can of Coke with someone! Thanks to Dexter Flood for the photographs and information. This site contains material which may be copyrighted by others ("Material"), the use of which has not been specifically authorized by the copyright owner, if any. We are making such Material available for non-profit educational purposes, and for the purpose of one or more of (a) comment, (b) news reporting, (c) teaching, (d) scholarship and/or (e) research. We believe this constitutes a 'fair use' of such Material as provided for in Section 107 of the U.S. Copyright Laws. For more information on Section 107, go to: http://www.law.cornell.edu/uscode/17/107.shtml. If you wish to use any such Material for purposes that do not constitute 'fair use', you must first obtain permission from the copyright owner.